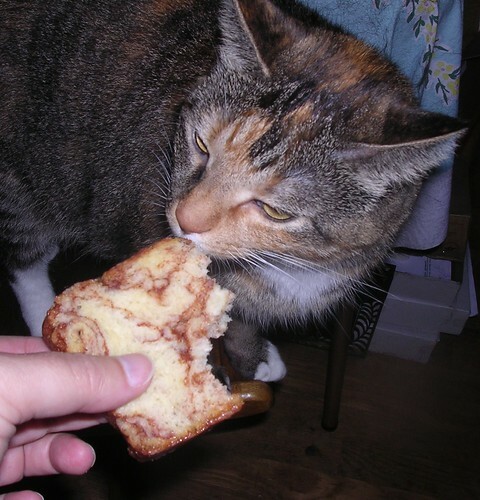 Deb's Cup of Tea: Cats don't eat this. So I'm a pushover. Mija has quickly learned, if she follows me into the kitchen and meows, I might let her have something of what I'm making. Unlike my former felines, these two are picky. They won't eat just anything I have. And, many times, Mija will take a bite and decide it wasn't what she was expecting. Yet she still wants to smell it even if she's decided previously that she hates it. I went grocery shopping over the weekend. I was out of everything. At Whole Foods, where I bought meat to last me into next month, they had loaves of this cinnamon bread next to the check-out. It's a favorite impulse purchase point. Put something enticing at the register and people will probably snap it up. Well, it looked good and smelled wonderful so why not? After coming home and putting everything away, I sat down to work on my finances and brought a couple slices of the bread, with tea, into the office. Of course she wanted to see what I had. I think her left ear says it all. She sniffed, gave me a look that would curdle milk and left. If Pilchard sees that Mija gets to sniff something, she's right on Mija's tail to have a whiff. Pilchard didn't even smell it. One look and she went back to lying on the settee. The bread was incredibly good, by the way.